The Santa Cruz County Farm Bureau has been informed that it will receive the “County of the Year” award at the California Farm Bureau 95th Annual Meeting. The Santa Cruz County Farm Bureau has been informed that it will receive the “County of the Year” award at the California Farm Bureau 95th Annual Meeting in Monterey this December. It will also receive five County Activities of Excellence Awards in the categories of Membership, Policy Implementation, Leadership, Ag Education and Public Relations. The county will also receive President’s Awards for Policy Implementation and Public Relations. 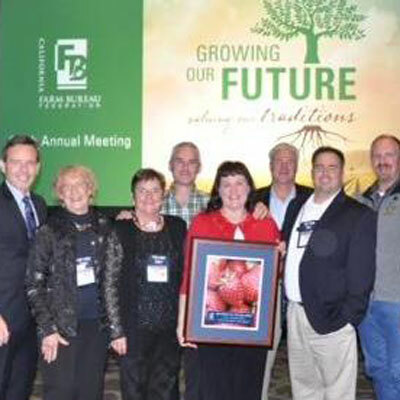 A local delegation of nine will be attending the California Farm Bureau Federation’s 95th Annual Meeting in Monterey, California, December 7-11. The official delegates representing the Santa Cruz County Farm Bureau are Cynthia Mathiesen, President and David Van Lennep, 1st Vice-President. Alternate Delegates are Tom Broz, 2nd Vice President and Chris Enright, Past-President. Also attending from Santa Cruz County are: Lorraine Mathiesen, Farm Bureau member; Jess Brown, Executive Director; Nita Gizdich, Board Member; JJ Scurich, Young Farmers & Ranchers Committee Chair and Rita Scurich, District #10 Representative on Young Farmers and Ranchers State Committee. “We are very honored to receive the ‘County of the Year’ award in our membership category. We are proud to be one of the best County Farm Bureaus in California” said Mathiesen. She further stated, “The Annual Meeting is a great opportunity for Farm Bureau members throughout the state to discuss mutual issues that affect farming. It is also an opportunity to meet, make new friends while preparing our organization for the legislative issues that lie ahead in 2014.” There are 53 County Farm Bureaus in California.